I’ve been through Osterley on the tube dozens of times on my way to Heathrow and I always think to myself that one day I’ll get off and visit Osterley Park. The years have rolled by and the trips to Heathrow gone on, but the visit to Osterley Park has eluded me – until now. What a lot I’ve been missing. The house at Osterley Park was originally a Tudor mansion but was redesigned by Robert Adam in the eighteenth century It took twenty years to remodel the inside and the outside of the house. It’s now a National Trust property and the inside, which is gorgeous, is well worth a visit, but I’m not going to talk about it now or we’ll never get to the end of this post. 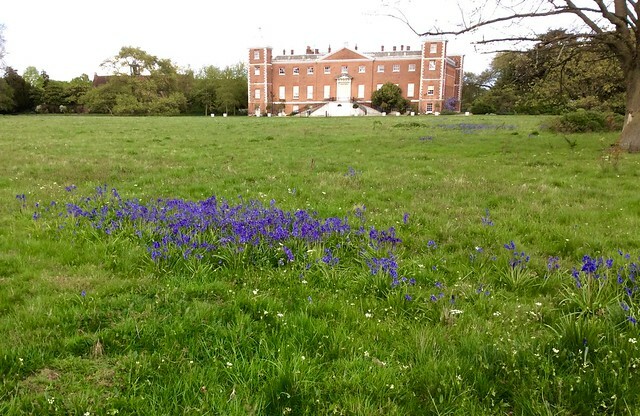 I went to Osterley because it’s bluebell season, and I’m a bit of a bluebell fan. 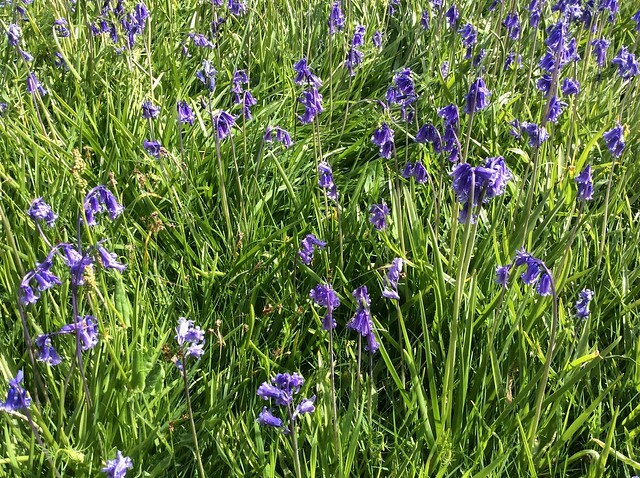 Not the kind of bluebell that grows all over my garden, and probably yours too. 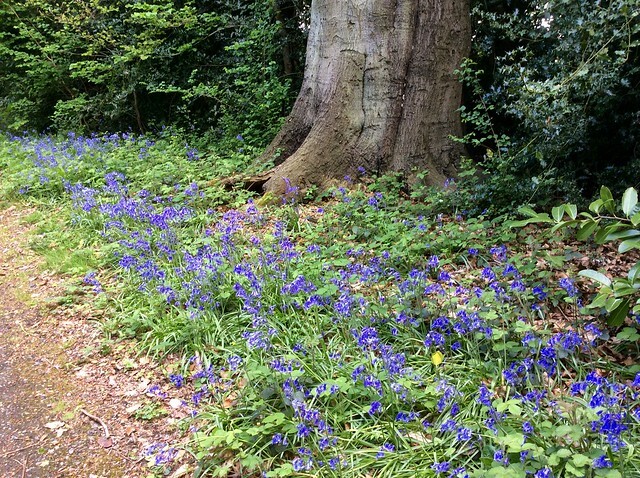 That’s the Spanish or hybrid bluebell, which stands up straight with flowers evenly arranged around the stalk and has very little smell. 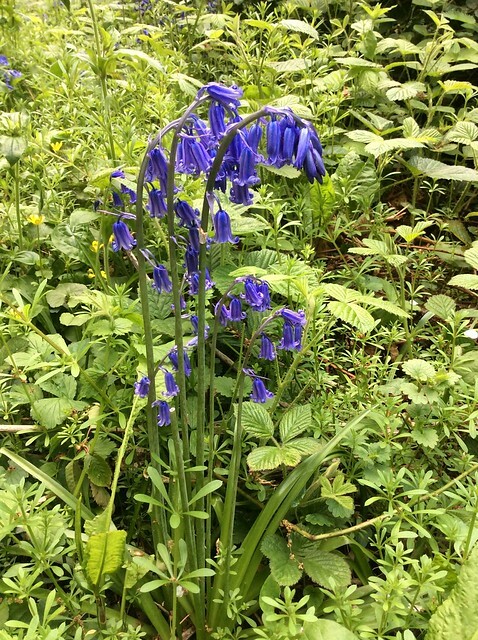 No, I was after the elusive English bluebell, delicate and deep blue with flowers growing on one side of the stalk so it droops over at the top, and with the characteristic bluebell smell of my childhood. 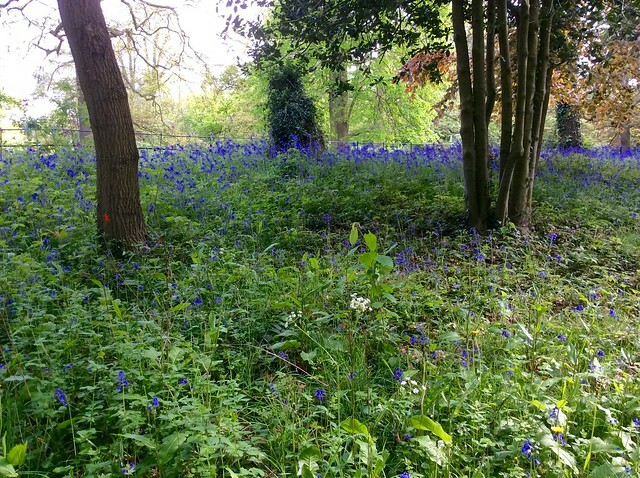 English bluebells are now so rare they’re protected by law so you can’t pick them. 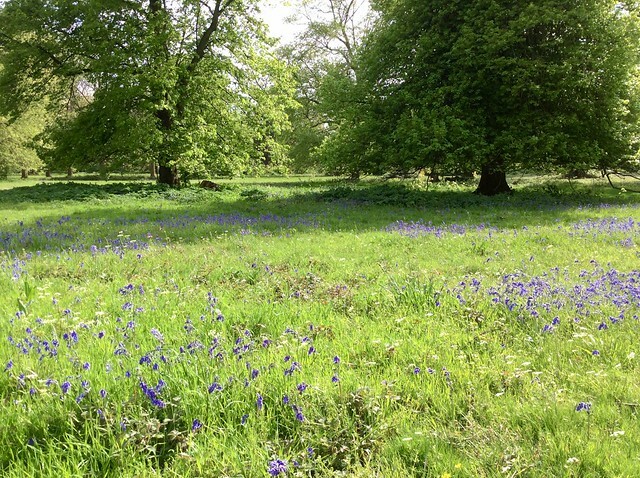 At Osterley the Long Walk and the Great Meadow are full of bluebells. I had them pretty much to myself late yesterday afternoon. I have to admit I was bowled over by the wisteria that covers one wall of the house. 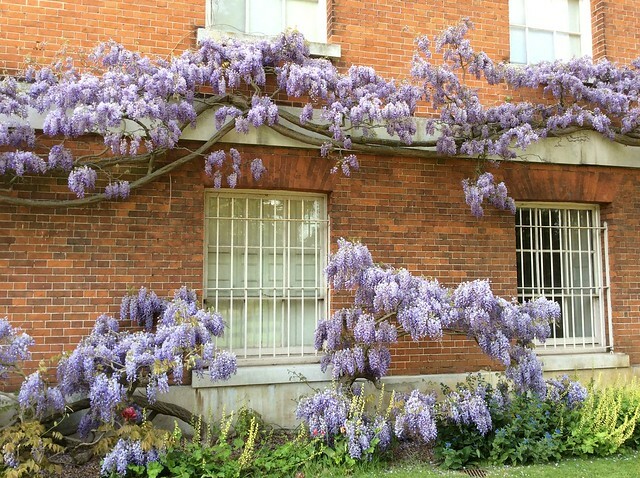 Wisteria is greatly treasured in Japan, where some species originated and you can see some spectacular examples there, but I was quite content with the display at Osterley. 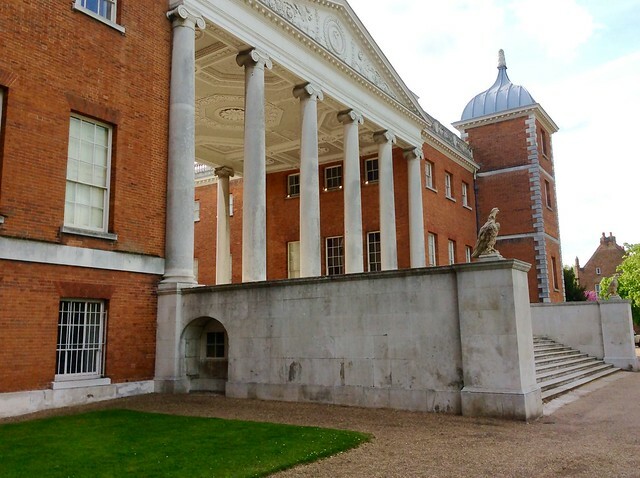 I can thoroughly recommend a visit to Osterley, a country mansion in the London suburbs. It’s a five minute walk from Osterley tube station, some of it unfortunately along the Great West Road, but as soon as you set foot inside the park gates it’s like being transported to the country, where nothing but green fields, shady trees, cows and horses meet the eye. 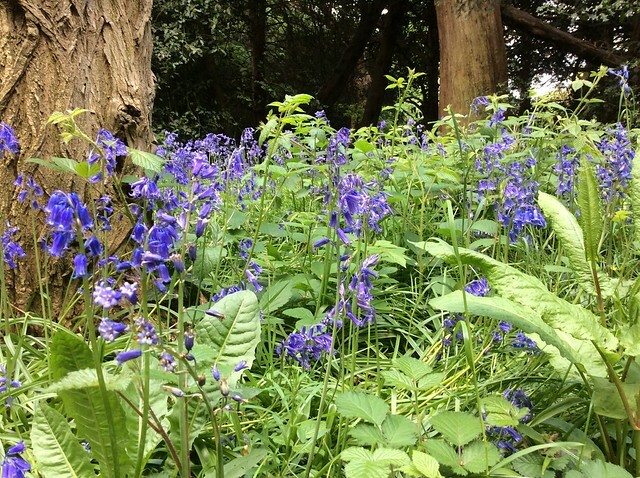 And the bluebells are in flower now. 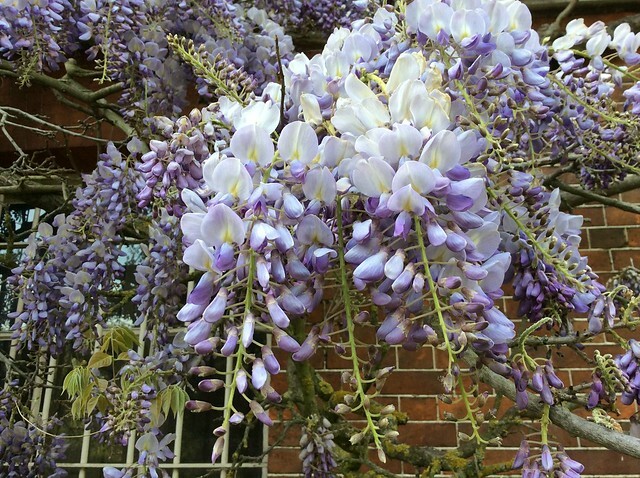 This entry was posted in Flowers and plants and tagged Bluebells, flowers, gardens, London, nature, Osterley Park, plants, Robert Adam, wisteria by Fran. Bookmark the permalink. I hope Italian bluebells are like English bluebells, not the Spanish sort. 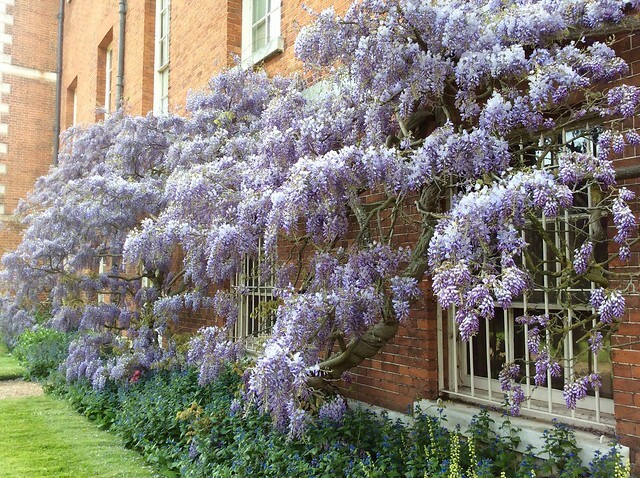 Japanese wisteria is really special – but the lack of bluebells is a shame. I have both sorts of bluebell in my garden, and every year I resolve to dig up the Spanish ones and chuck them out, but I can’t bring myself to do it. They’re not as easy to get rid of as you might think. I’m fighting a losing battle. Yes, and it’s in full flower at the moment, so worth a visit. Alas I must be content to admiring it in your photos – thanks for sharing! How beautiful! I’ve never seen bluebells and wisteria together. I too have gone by Osterley so many times on route to Heathrow and never stopped in. It’s a little reminder there’s a different world out there if you stop to look.